So you want to buy a piece of land and build yourself a home? Here’s what you need to do. It may seem a little daunting, but you’ll get through it. We can help with information and advice. Just ask us. If you’re dividing a lot off of another existing parcel start with Section #1 below. If you have a single lot and want to build on it, go to Section #2. Separating a lot from another parcel is called a subdivision. Subdivisions require a three-level approval process—local (Planning Commission); county Planning Department and Health Department); and back to local (Supervisors). Secure approval for an on-lot septic system. If you can’t get septic approval you can do nothing with the land except farm and raise livestock. Call Pete Homchenko from Erie County Health, 451-6756, between 8 and 10 am. He will explain the entire process and guide you through it. Hint for locating septic leach fields: Look for groundhog holes. They only build their homes where there is good drainage.Draw a sketch plan of the property and show the lot that is being divided from the larger parcel and the larger parcel. Every lot must have frontage on a public road. The minimum is 250-foot frontage and at least 2 acres in size.There are exceptions. If these size limits are not possible, ask us about different options.The sketch plan must show all dimensions of all parcels with existing and proposed buildings; wells; septic systems; and leach fields. Bring this sketch plan to the Township Office at least one week before the Planning Commission meeting for preliminary approval. The Planning Commission meets the first Tuesday of every month at 7 p.m. at the Township Building. Plans received before the one-week deadline will be presented for approval. Plans not received at least a week in advance will be delayed one-month. If approval is given, have a surveyor survey the property and create a Mylar and at least six copies. Bring these plot plans to the Township Office at least one week before the Planning Commission meeting. You must also provide a CD with a pdf file of your survey. There is a $160 fee, submitted at this time. $150 will be refunded to you when you bring us a recorded copy of the subdivision at the end of the three-part approval process. When presented to the Planning Commission they will review it for compliance with the subdivision ordinance and will sign and date it. Take the Mylar to the Erie County Planning Department, Room 119, First Floor, Erie County Courthouse. Their phone number is 451-6336. They will review it and approve it. They know our regulations and approval will be routine unless there is a mistake. As part of the process, the Planning Department will forward the plans to the Health Department where they will concur. The plans must show the previously approved location of the well and septic systems. Or, a stamp will be applied that no approval for septic has been given. If you have previously contacted the Health Department for a system approval, there may be a sewage planning module that needs completed by you or your surveyor or engineer and signed by us. Note: You can speed up this process by hand carrying the plans from the Planning Department to the Health Department. Notify us at least one week before the next Board of Supervisors meeting that your plans will be presented for approval. These meetings are held the second Tuesday at 7 p.m. and the last Wednesday at 8 a.m. of each month at the Township Building. They will be signed and dated. Have the real estate closing. The plans must be recorded at the Recorder of Deeds Office, Room 121, First Floor, of the Erie County Courthouse within 90 days of the Supervisors signing. Failure to have the Mylar properly recorded within the 90 days results in you having to start the process all over again. Bring us a copy of the plan with the recording stamp on it. We will exchange it for the one we ekpt after the Supervisors approval and send you your $50 refund. Go to Section #2 to build your home. This entire subdivision process usually takes 6 to 8 weeks to complete. 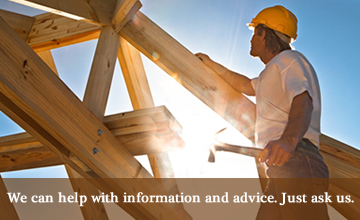 Please plan ahead and allow for this time period before you schedule a builder. Rear yard: 50 feet from the rear property line. Determine the outside dimensions of your house, garage and any out buildings that you are planning to build with the zoning/assessment permit and the building permit that you are going to get. Determine the location of your driveway entrance. You have six months to start construction. Do not include outbuilding, garages, etc. on the permit applications unless you plan to start construction within six months. Determine the cost of your improvements. We need this information on the zoning/assessment permit. Complete the zoning/assessment permit application and bring it or mail it to us with the $40 application fee. The UCC building permit application with additional fees will follow zoning approval. Note: zoning permits take approximately two weeks after you turn in your application. Add another two to four weeks for UCC Building Permits. Failure on your part to plan ahead does not necessitate a crisis on our part when your builder shows up and you do not have your building permit. Please–plan ahead. Get your house number assigned. Measure to the center of your (proposed) driveway from either property line. Use +/- 5 feet precision. We can assign your house number on short notice if we have the measurement and you can tell us where the driveways are that may be across from yours. It is important for emergency response purposes to have all house numbers in order on a road. You cannot change your driveway location after your house number is assigned to it. As always, if you have any questions or concerns, we are here to help. The Township phone number is 734-3521.